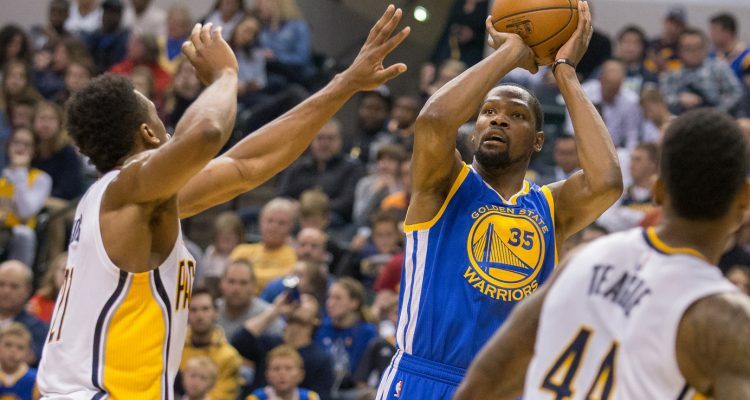 The Golden State Warriors had little trouble turning up the speed and blowing out a depleted and tired Indiana Pacers team on Monday night in Bankers Life Fieldhouse. The Pacers, coming off an overtime victory 24 hours earlier and without the services of Paul George and Myles Turner, could muster little resistance to the Dubs’ offensive onslaught. Stephen Curry, Kevin Durant, and Klay Thompson combined for 61 points in three quarters of work while Golden State’s previously 20th ranked defense held Indiana to an opponent season-low 32 percent shooting from the field. The Warriors wrapped up a perfect four-game Eastern Conference swing and extended their league-best win streak to eight. 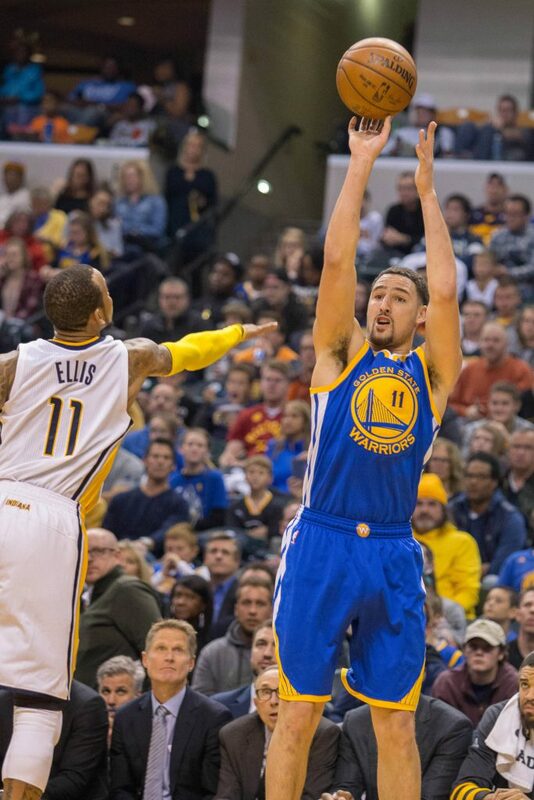 2) Klay was fantastic again amassing a game-high 25 points on only 18 shots. Don’t look now, but after a blazing-hot road trip, Klay’s averages are creeping back up. 20.4 points per game on 47% shooting (35% from deep). 4) Steph didn’t exactly bust out of his recent cold shooting streak from long range (20 points, 2-6 on 3s) but he did have the shot of the night. What’s more exciting in the NBA right now than the MVP getting the ball behind mid-court with time ticking down? 5) Given the extra helping of garbage time, we were treated to a fourth quarter of Patrick McCaw flexing his offensive muscles. When Pat’s playing with the starters, he’s usually looking to swing the ball to an open teammate and rarely shoots unless he’s wide open. But with the subs last night, the rookie was more assertive on offense and showed off a slithery skill set with the ball that should get better as the season continues. 6) One fun nugget of the Javale McGee experience is watching the Dubs relentlessly (and recklessly) throw lobs at the rim each time he’s in the game. It reminds me of when I was in junior high and there was that one really tall dude in the neighborhood that could dunk. Every time he was on my team all my buddies and I would throw junk at the hoop just to watch him smash it on a fool. There really needs to be a 2016-2017 YouTube montage of failed McGee lob attempts. 8) Since November, Andre Igoudala has been shooting a respectable 37 percent from behind the arc (31% for the season). When the Warriors’ offense was grinding and stalling earlier in the year, Igoudala was repeatedly forced into tightly contested 3-pointers with little time on the shot clock, a big reason for his low percentage in the first five games. Now that the team has settled into a better groove offensively (currently tops in the league in offensive efficiency by a mile) Igoudala is getting ample space and time to fire off his long ball. And when he gets those shots with nary a defender in sight, Andre has been banging them home. He’s currently connecting on 42.1% of Wide Open 3-pointers (per NBA.com). Andre is a good 3-point shooter as long as he has time to set his feet, gather the ball, bend at the knees, check his Twitter feed, and slowly begin his upward jumping motion while cocking the ball back. 9) Somehow, Monta Ellis (5 points, 2-8 shooting) and David Lee need to end up on the same team again so all our eye-test-only, I-don’t-need-advanced-stats friends can finally be happy. 10) After a “slow” start, the Warriors have the second best record in the league at 12-2 and own a 10.3 point differential that’s second only to the Clippers (who are currently playing out of their minds). Sure, the Dubs have played only six teams with a .500 or better record and their strength of schedule is the third weakest in the NBA thus far (per ESPN.com) but they’re beating the teams they should beat while Steve Kerr continues to tinker with lineups and rotations. They’ve yet to get all three of their best scorers on track in consecutive games and they’re defense is still a work in progress. Somehow for a team that’s on pace to win 70 games, there remains significant room for improvement. Pin Tsan is an unabashed Warriors fan. He once told a Lakers follower, "Larry Hughes is every bit as good as Kobe Bryant." He's unrepentant. He is from the bay area.